All Praise is due to Alláh, We praise Him and we seek help from Him. We ask forgiveness from Him. We repent to Him; and we seek refuge in Him from our own evils and our own bad deeds. Anyone who is guided by Alláh, is truly guided; and anyone who has been left astray, will find no one to guide him. I bear witness that there is no god but Alláh, the Only One without any partner; and I bear witness that Muhammad, sws, is His servant, and His messenger. O You who believe, – be aware of Allah, with correct awareness, and die not except as Muslims. O You who believe, – Be aware of Allah, and speak a straightforward word. He will forgive your sins and repair your deeds. And whoever takes Allah and His Prophet as a guide, has already achieved a mighty victory. O mankind! Show reverence towards your Guardian-Lord Who created you from a single person, created, of like nature, his mate and from the two of them scattered (like seeds) countless men and women;― Be conscious of Allah, through Whom ye demand your mutual (rights) and (show reverence towards) the wombs (that bore you): for surely, Allah ever watches over you. 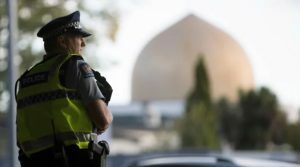 In New Zealand two Fridays ago, two mosques were attacked during Jumuah prayers. Dozens were killed and dozens were injured. We ask Allah to reward those who died as martyrs. They deserve a high place in Al Jannah Firdaws. We also ask Allah to help the injured to a quick and complete recovery. We know that the trauma, the emotional wounds will take longer to heal. We ask Allah to give their families and their friends the strength and patience that’s needed in this time of loss. We also ask Allah to reward those who stood up to condemn this hate crime, like the Prime Minister of New Zealand. She has shown the kind of leadership that is so lacking in the world today. Hate crimes like this are intended to divide people, but in New Zealand it has united them. It has brought so much empathy, so much love and respect to the Muslims there. In a crisis you really get to know who your friends are. Out of this great suffering, Muslims have found so much mercy and respect. An Imam was asked to recite the Quran at the opening of New Zealand’s parliament. New gun laws were passed, and the adhan was broadcast live over national TV and radio. Burial expenses were paid by the government and the country had a national ‘Hijab Day.’ One old lady was asked why she was wearing a hijab, and she replied: “I’m here to protect my Muslim neighbours. If anyone wants to shoot, they’ll have to kill me first.” Allahu Akbar! Allah is great! Imagine that, my dear brothers and sisters. Before the shooting, who could have foreseen this tremendous response from our non-Muslim neighbours? Over here, Father John Dickson, the Roman Catholic Chaplain at Royal Holloway University, sent me his condolences. In our duah, let’s ask Allah to bless those who express their love and support to us at this time of grief. This is how the Muslims reacted when the Quraish approached them with a mighty army after the Battle of Uhud. Even though many of them were badly injured and utterly exhausted, they rallied to the call when Prophet Muhammad sws heard that the enemy was regrouping for a final assault. When the Quraish saw the Muslims’ fearless determination, they backed off and went home. We should always remember this. Don’t fear anyone except Allah. Don’t panic. Be Islamic! Remember that Allah is fully in control at all times. The future is safe in Allah’s hands. Trust Allah. Have faith. What hit you could not have missed you. What missed you could not have hit you. So let us not despair, my dear sisters and brothers. To despair of Allah’s mercy is a great sin. Good times and hard times come round in cycles. It’s a test from Allah. And Allah is always in control. Don’t worry. History is in good hands! Glory to Allah! Praise to Allah! There is no power and no strength except from Allah! So there we have it, my dear Sisters and Brothers. Guidance from Allah only comes to those who put their complete trust in their generous Life-Giver. When we trust Allah and when we invoke His holy Names in constant remembrance (dhikr), Allah raises us to a higher station. We become more resilient. We don’t get anxiety attacks. We’re calm. We take all the ups and downs of life with a smile. Our hearts are always in a state of peace, tranquillity (sakeena). That’s when our inner peace can shine outwardly to light up our relations with others. Hate crimes should never provoke us to take revenge. That’s the work of tormented souls who allow themselves to be influenced by Shaitaan. If we retaliate, then we simply “give an eye for an eye and a tooth for a tooth.” This behaviour only prolongs a circle of violence until everyone is blind and toothless. Revenge only massages our bruised egos, our damaged pride and self-esteem, but it doesn’t solve the problem. The real problem isn’t just the killer. It’s the whole toxic climate that enabled him to do the killing. By the way, Imam Muhammad Mahmoud of Finsbury Park Mosque, was at Buckingham Palace yesterday. He was awarded an OBE for saving the life of a terrorist who hates Muslims. In 2019 this man drove his van onto a crowded pavement outside the mosque. He killed one and injured nine others. The angry crowd tried to attack the man, but the Imam protected him, saying that we shouldn’t respond to a cowardly act in the same way. We are not cowards, we are Muslims. The man was sentenced to life in prison, with a minimum 43 years. My dear brothers and sisters, this Imam truly shows us how to return a bad deed with something better. We Muslims must of course, take what steps we can to keep safe. But we must never be provoked to retaliate. It really takes a lot more courage and self-discipline to resist provocation. Remember that when you control your anger, when you restrain our desire for revenge, then Allah opens the doors to His Mercy. But what must we do to make things better? When we give our time and effort to helping others then Allah will soften their hearts and turn our enemies into friends. That’s the reward for “returning an evil deed with something better.” That’s Allah’s promise. And Allah never breaks His promise. Fadth kuroonee adth kurkum, wash kuroolee walaa tak furoon [2:152]. wala thikrul-Laahi akbar, Wal-Laahu ya’lamu maa tasna’oon.” [29:45].